Marco Polo again pushes us a little further up the learning curve. Ján Levoslav (or Johann Leopold) Bella was a Slovak composer, born in Lipto-Szentmiklós (or Liptovsky Sv. Mikulás, depending on whether you favour the Hungarian or the Slovak version) in 1843, studying theology in Banská Bystrica and then composition in Vienna with Simon Sechter, who also taught Schubert and Bruckner. After ordination in 1866 Bella taught and composed in Banská Bystrica before, in 1869, moving to Kremnica (Kremnitz) as the city's director of music. In 1873 he again took up his studies, in Germany and Prague; and in 1881 he left the priesthood and took up the post of Stadtkapellmeister in Hermannstadt - now Sibiu in Romania. In 1921 he retired to Vienna, living with his daughter (he had married the year after his move to Hermannstadt). He spent the last eight years of his life in Bratislava, where in 1936 he died a few months short of his 93rd birthday and where his opera, Wieland the Smith, had first been performed only ten years previously. Apart from Wieland, Bella's output comprises a symphonic poem Schicksal und Ideal, several large-scale choral works, chamber and instrumental music and songs. 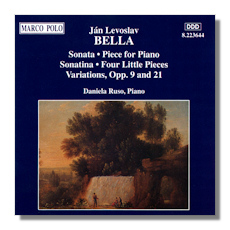 This generous collection of piano pieces - the complete Bella oeuvre for piano - gives a fair conspectus of his style. At its base lies the Hungarian nationalism of Liszt, with a fair admixture of Erkel and Schumann - the result often sounds like Liszt a few pounds too heavy. The textures are usually thick, the piano-writing demanding; indeed, Bella occasionally gives in to the temptation that often faces the proficient dilettante composer: he is prone to over-writing. But there is a heroic tone to the music which, when it works, gives it a genuinely impressive edge. It's obvious that Bella was a man of substantial ability, even if news hasn't spread too far beyond the city-gates of Bratislava. On the strength of the two early sets of variations here, which are attractive but not particularly memorable, you might put Bella down as a sizable local talent. The B Flat minor Sonata of 1882 would have you re-assessing him upwards, and the two movements that form the torso of an unfinished sonata (undated in the notes) require more admiration yet. There is something in Bella's music here which has a slight suggestion of the later power and calm dignity of Franz Schmidt, also a native of Bratislava - or Pressburg, as it was in Schmidt's day (it was also the Hungarian town of Pozsony). Surprisingly, the most individual writing comes in the early Four Little Pieces of 1866-69, which have a terse and lively sense of wit. So in the long run it's not just a touch of local colour: this is music that deserves wider circulation. A enterprising pianist could begin by slipping the Four Little Pieces into his recital programmes; his audience would be sure to want more. Daniela Ruso is another Bratislava musician, who plays idiomatically and with feeling, tackling some pretty fearsome pianistic hurdles with ease. The highest praise you can give her is that you don't really notice her playing, for she doesn't get in the way of listening to the music. Another of those discs that reveals, no, not another undiscovered giant, but a composer who deserves to be heard and who, without the constantly enterprising spirit of Marco Polo, probably wouldn't have been. I am hoping that they'll be back for more, preferably for some of the chamber and choral music. In the meantime this piano disc is well worth investigating.